A Mastervolt battery monitoring panel brings an end to nasty surprises like a sudden shortage of battery power. 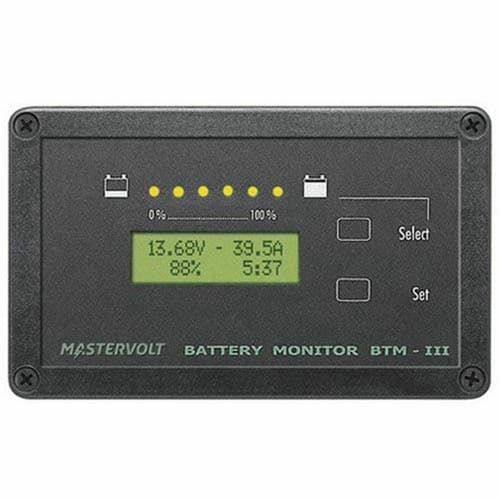 The Masterlink BTM-III battery monitor provides an accurate indication of the current amperage remaining time and remaining capacity of battery bank 1 and the current and estimated capacity of battery banks 2 and 3. The built-in microprocessor calculates the remaining capacity and stores historic data. The Masterlink BTM-3 includes ten languages: English French German Spanish Italian Dutch Norwegian Danish Swedish and Finnish.